First off – apologies that I missed blogging yesterday but I had my son all day and then our Lifegroup met in the evening. It was great actually to hear about what we had all been up to and how we had been getting on with 40acts together. Some had done well, some not so well, but we all agreed that we were starting to think more about opportunities to be generous and listening to that voice, that nudging of the Holy Spirit, that tells us when we should act. And funnily enough this morning’s challenge was about listening to your gut and that nudge when you get it. But first lets address yesterday!! Yesterday’s challenge was all about reducing our usage of plastic and understanding it’s impact on the world. I wasn’t really sure how to do this, as I already recycle and don’t really buy many take out drinks. Instead, I chose to continue to crazy post it note frenzy that I had started on Monday (because surprisingly I didn’t complete my challenge of using up all 100 in one day….). I wrote some nice notes and stuck them inside the lockers and my local swimming pool. So although I didn’t succeed in the specific challenge for that day, I was at least trying to see opportunities to be generous. Today went much better, and I actually acted on something that has been nudging me for a few weeks now. At Toddler Time there is a lovely mum who comes each week with two children. Some weeks she looks tired and harassed, and she always sits on her own. I keep trying to smile at her and attempt to make conversation but it is difficult. I had this nudge to do something to encourage her to keep going, as I imagine hers is quite a lonely world. So today I sneaked a chocolate bar with a post it note attached onto her table and scampered off. I didn’t see her reaction as I was chasing after Sam, but I pray that it encouraged her. I am just glad that I finally had the courage to listen to my gut and do it. I'm not totally understanding why or what you mean about post it notes and recycling and not using plastic. You want to encourage the large woman, you mean to diet or exercise? I don't know what the 40 acts thing is either, but it must be a meme for blogging thing? I'm gearing up for the a-z challenge and am out visiting blogs, always nice to meet new bloggers. Looking forward to getting acquainted. 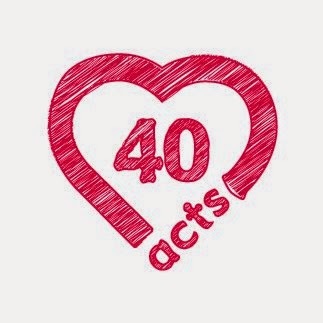 Hi sandy – yes it probably wont make much sense if you don't know about the 40 acts challenge – I did include the links at the top of this blog, but as it is an ongoing series you probably have to read them all or the 40acts website for it to make much sense. Basically each day we are emailed a challenge with a generosity theme – whether it be to friends, family, strangers, the world we live in. Definitely worth a look!